Garden of Riches slot machine is a Novomatic-powered 5-reel 10-pay line video slot which offers a progressive jackpot. The story behind the game revolves around a beautiful ginger-haired lady who will be your host on your trip to the Garden of Riches. Standing for Scatter and Wild, she will undoubtedly help you win bigger payouts. If you manage to fill the reels with her portraits entirely, you will hit the progressive jackpot. In terms of aesthetics, this is a typical Novomatic slot with mediocre graphics and generic sound effects. The game is available for online and mobile play, so you can enjoy it whenever and wherever you are and win your share of the riches. The reels are set against the background depicted as a well-trimmed garden which looks inviting enough to take a stroll through it. Besides the beautiful lady, the reels are home to a guy with a red rose obviously trying to steal her heart and a set of jewellery pieces like a golden diadem, emerald ring and golden rose. They are responsible for high-value awards while standard playing card symbols pay lower amounts. You need only two female or male symbols to win a prize, while all other symbols pay for combinations formed with three or more identical symbols aligned along an active pay line in succession starting from the leftmost position. Before you set the reels in motion, choose a bet from the range between £0.40 and £50 per spin. All standard Novomatic features are available including Autoplay allowing you to enjoy the game without spinning the reels manually and Gamble which will double your payouts if you guess the colour of a mystery card correctly. The top-paying symbol in the game is the lady awarding 500x your line bet for a five of a kind combination. In addition, landing 3 or more lady symbols anywhere on the reels activates 10 free spins which can provide you with a highly rewarding gaming experience. During free spins, Lady Scatter turns into sticky Wild which stays at its position during the feature thus increasing your winning chances. The free spins feature cannot be retriggered. The Garden of Riches slot comes equipped with the progressive jackpot which can be life-changing. To win it you have to land 15 Lady Scatters on the reels. To put it simply, you have to cover the screen with lady symbols completely. However, you should keep in mind that the value of the progressive jackpot depends on your wager. If you place the maximum bet and hit the jackpot, you will earn the full amount. Otherwise, the corresponding amount will be added to your balance. 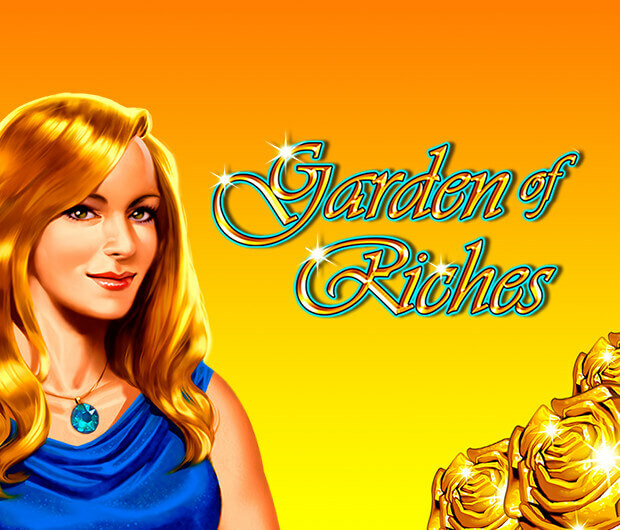 To make the most of playing the Garden of Riches slot keep all paying lines active and you can win some huge payouts, especially during the free spins feature with Lady Scatters turning into sticky Wilds.